Summary : Located on Hawaii's Big Island, this family run establishment serves fresh pies with laid-back vibes. Back in 2014, I took my first trip to Hawaii and was really disappointed with the pizza there (see here and here). I know… I know… Hawaii isn’t known for its pizza. 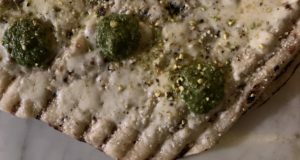 But I was impressed with so many other dishes on that trip — from the care that was put into their preparation to the quality of the ingredients used — and it was too bad that didn’t translate to the pizza I ate there. When I returned to Hawaii a few months ago, I was determined to track down some decent pies. 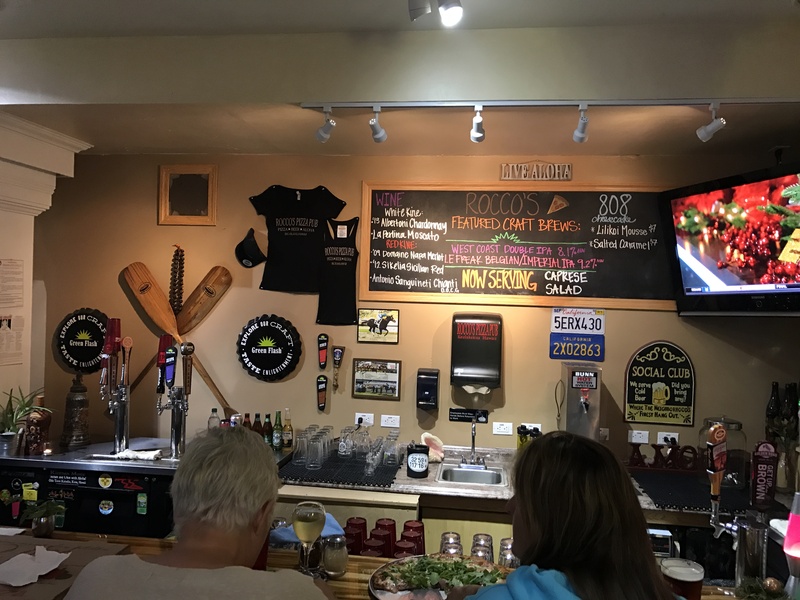 My favorite spot on the trip was a family-run pizzeria on the western coast of the Big Island, about 10 miles south of Kona: Rocco’s Pizza Pub (79-7460 Mamalahoa Highway). A brief note on how I ended up there. A family member made a non-urgent trip to the emergency room one evening. The ordeal took a few hours and as the clock struck 9PM, I was tasked with doing a food run. Not only was Rocco’s two minutes from the hospital. And not only did Rocco’s have decent reviews online. But… it was also one of the only places open in the area. So off I went. I mention all of this because I ordered all of our food to-go, so I could bring pizza back to the hospital for everyone. 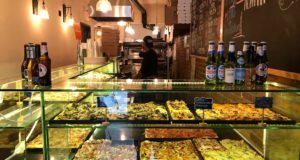 I usually don’t review a full-service pizzeria solely based on its take-out operations. But I spent enough time at Rocco’s (pizzas are made to order) to get a strong feel for the place. Rocco’s opened a year ago (although family members of the owners used to operate a pizzeria back in the day — so it’s in their DNA) in a complex that is home to a burger spot, noodle restaurant, and gelato shop. In the front of the restaurant is a narrow space with a couple of tables, followed by a bar area with about 8 seats. But the best spot in the house is out back on the patio. 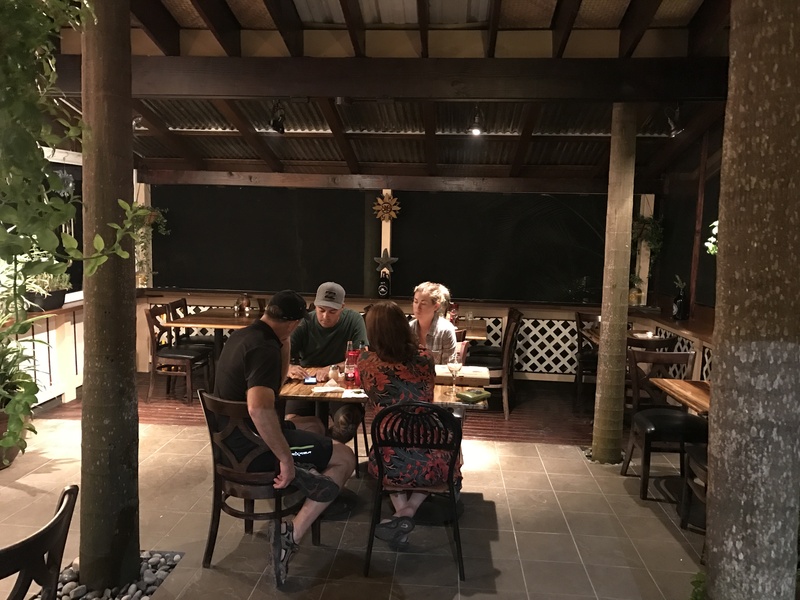 It makes sense that most of the restaurant’s seats are outdoors given how warm it typically is on this part of the island. 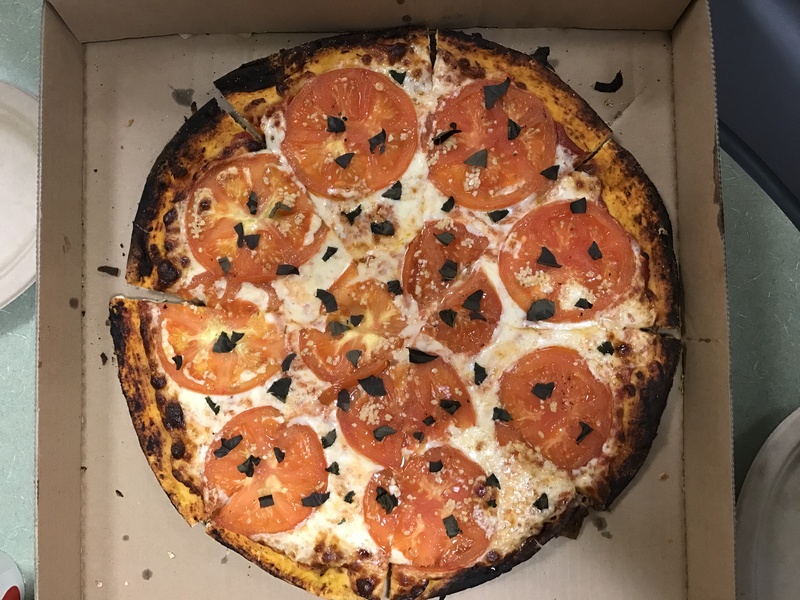 We ordered our food at the bar and got a large cheese pizza and a large “So Cal” pizza with tomato sauce, mozzarella, tomatoes, basil, garlic and olive oil. The latter was merely average, but I really liked the regular cheese pie. 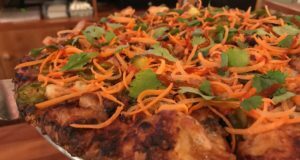 It was reminiscent of bar pies from Colony Grill and Star Taven — a little thicker, but a familiar flavor. 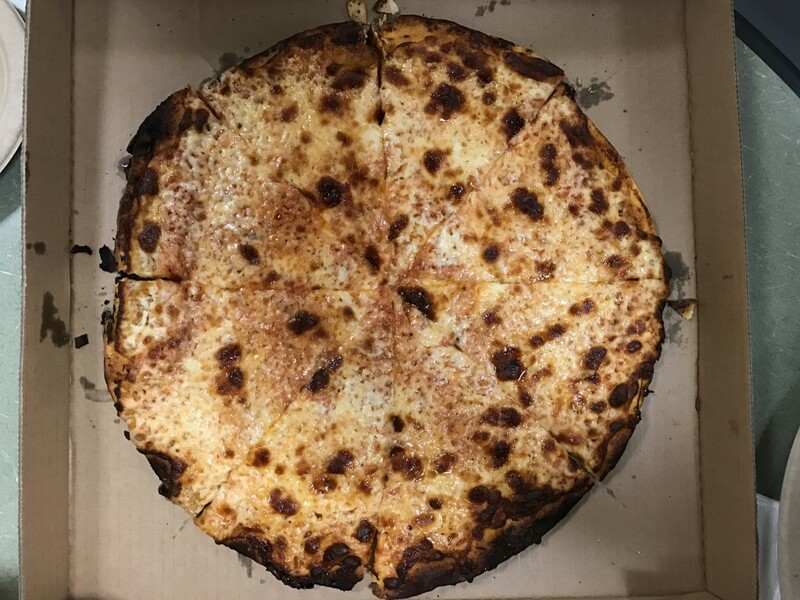 Although there are 11 “specialty” pies on the menu at Rocco’s, my advise is to keep it simple based on my limited sample size. One cool offering at Rocco’s is that they make a heart shaped version of the cheese pie. I didn’t get one, but it’s something fun kids (it’s a mini $6 pizza). All other pies come in three sizes: 9 inch ($11), 12 inch ($13), and 15 inch ($15). With price breaks like that, as might as well order a large, which feeds two people. We also ordered a Caprese salad, which I wasn’t thrilled with. But I thoroughly enjoyed a slice of “808 Cheesecake” which is delivered daily from a local bakery. The beer list is also strong. Rocco’s also offers live music throughout the week (a staple at many Hawaiian restaurants) and the tunes were going strong even late on a Thursday evening. 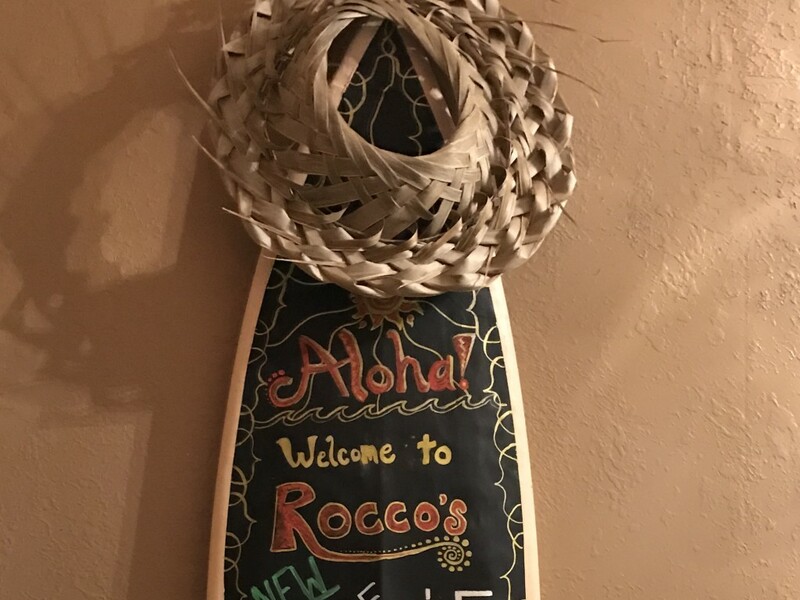 It’s those Hawaiian vibes which make Rocco’s such a cool pizzeria. 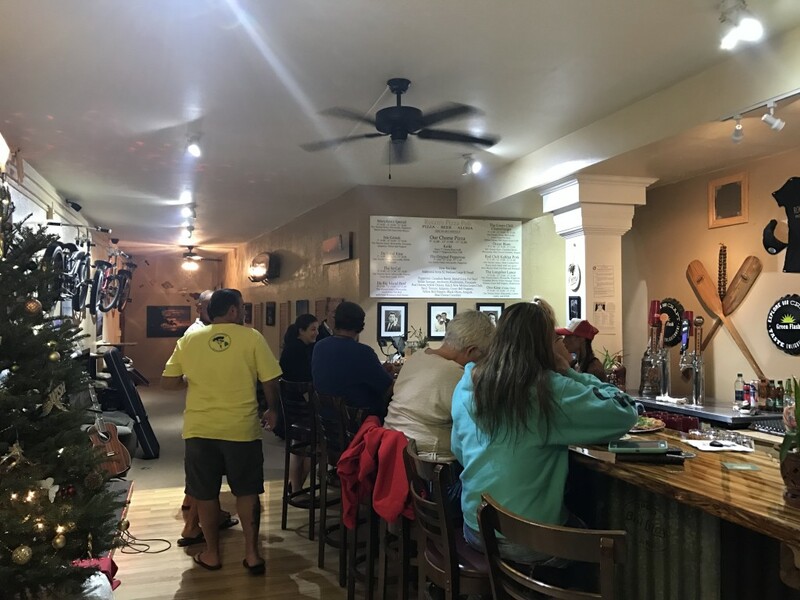 It’s a laid back, family friendly, music playing, pizza-heart serving spot — exactly what you’d want from a pizza place in Hawaii. 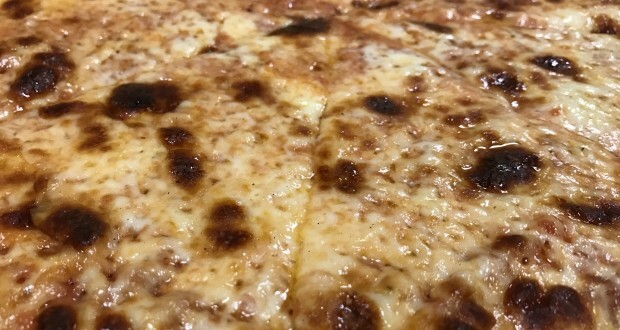 And hey — the cheese pie is super tasty. So enjoy a few slices on the back patio, grab a beer, and soak up some tunes. And make sure to say “mahalo” on your way out.